The last time UVa. 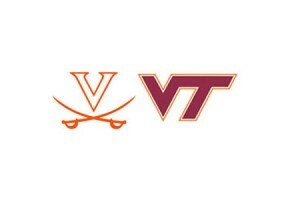 football defeated Virginia Tech was 2003. This is before Facebook, so there’s something to ponder. Virginia football fans haven’t been able to post to Facebook, We beat Tech! Mike London was on the sidelines in Charlottesville that day as the defensive line coach under Al Groh. (London was also Groh’s recruiting coordinator.) So London, ostensibly, can remember what it felt like to beat Virginia Tech. Marques Hagans, the wide receivers coach, was on that 2003 team, so he can attest. And Anthony Poindexter, the safeties coach, played at UVa. in the late 1990s, and as a player he knows the feeling. And then there’s Tom O’Brien, who beat Tech as an assistant at UVa. and as a head coach at Boston College. And Jon Tenuta, who’s coached practically everywhere, he has a W.
So there is institutional knowledge in Bryant Hall of what it takes for a Virginia team to beat Virginia Tech. Which is good, because the guys in uniform haven’t the first clue, considering that most of them were in elementary school the last time it happened. “It’s not something that you constantly talk about because it’s a given, basically. And now that the week is here, now the focus is on this opponent, who they are, what we have to do, not what’s going on with them, it’s just about the things that we need to do in order for us to be competitive and win a football game more than anything else,” London said at his weekly press conference on Monday. Virginia has lost the last nine and 13 of the last 14 in the series, but the ‘Hoos seemed to be on the verge of breaking through last November, up 14-7 in the third quarter with a chip-shot field-goal attempt in the offing. London decided on a fake that came up short, Tech scored in the fourth quarter to tie the game, and won in the final seconds on a field goal that saw London criticized afterward for allowing the clock to run down to the last play with two timeouts in his pocket. In 2011, the two met in Charlottesville with the ACC Coastal Division title on the line, but Tech dominated in a 38-0 whitewash that started a freefall for the Virginia program. UVa. came into that game with an 8-3 record in London’s second year at the helm in Charlottesville, but the ‘Hoos record since the opening kickoff that November day under London is just 6-19. What can go wrong for Virginia in these games always does. It was a fake field goal and timeouts that were killer in 2012. In 2008, Virginia also led in the second half and was driving for the lead in the fourth quarter when a Marc Verica pass was picked off in the end zone to seal that one. A late first-half interception a year earlier, in 2007, in another game that was for the Coastal Division title gave Virginia Tech momentum heading into the locker room, and the Hokies dominated in the fourth quarter en route to posting a 33-21 win. Part of that can be attributed to the Virginia side waiting to see what will go wrong. Part of it can also be attributed to the Virginia Tech side waiting to see when the game will start working in its favor. Whereas there’s going to be no one in a Virginia uniform that knows what it feels like to beat Virginia Tech, there’s nobody in maroon and orange who knows what it feels like to lose to Virginia, and most of the kids on the Hokie sidelines were also in elementary school the last time that happened. Tech coach Frank Beamer tries to downplay the notion that his program enters these games with a psychological advantage. Compounding the issue for the Virginia side is that the Cavs are not only coming into the game on Saturday having lost nine straight in the series, but also having lost eight straight this season. Athletics director Craig Littlepage continues to insist that London’s job is secure despite that 6-19 stretch in his last 25 games and an 18-30 record overall, including an 8-23 record in ACC play in his tenure, but a blowout loss at home to the in-state rival to close out the program’s first 10-loss season in four decades may force the administration’s hand. For London, the focus isn’t there. It’s on getting that W that has proven elusive for a decade. Team of Destiny: Inside Virginia Basketball’s Run to the 2019 National Championship, by Jerry Ratcliffe and Chris Graham, is now available at a special pre-sale discounted price of $20. The book is expected to ship by May 15, 2019, and expected to retail for $25. Pre-order for $20: click here. The book, with additional reporting by Scott Ratcliffe and Zach Pereles, will take you from the aftermath of the stunning first-round loss to UMBC in 2018, and how coach Tony Bennett and his team used that loss as the source of strength, through to the ACC regular-season championship, the run to the Final Four, and the thrilling overtime win over Texas Tech to win the 2019 national title, the first in school history. Augusta Free Press launched in 2002. The site serves as a portal into life in the Shenandoah Valley and Central Virginia – in a region encompassing Augusta County, Albemarle County and Nelson County and the cities of Charlottesville, Staunton and Waynesboro, at the entrance to the Blue Ridge Parkway, Skyline Drive, Shenandoah National Park and the Appalachian Trail.